I’m thankful for every wedding I get to shoot, but it’s extra special when you get to be a part of your friends’ day. I’ve been friends with Taylor and Daniel for abour 5 years now, even before they started dating. When Taylor came to me telling me they had gotten engaged but didn’t want a big wedding, knowing their love for nature I suggested an intimate wedding with just close family in Yosemite. Neither of them had ever been, but trusted me with the idea and decided to go for it! Fast forward a few months and we arrive to our little cabin in the woods amongst the fall colors and crisp air. It was a relaxing and slow morning before we arrived to Glacier Point for their ceremony, with the glorious backdrop of Half Dome. They exchanged their vows and then danced on top of the valley and we shared a picnic lunch. 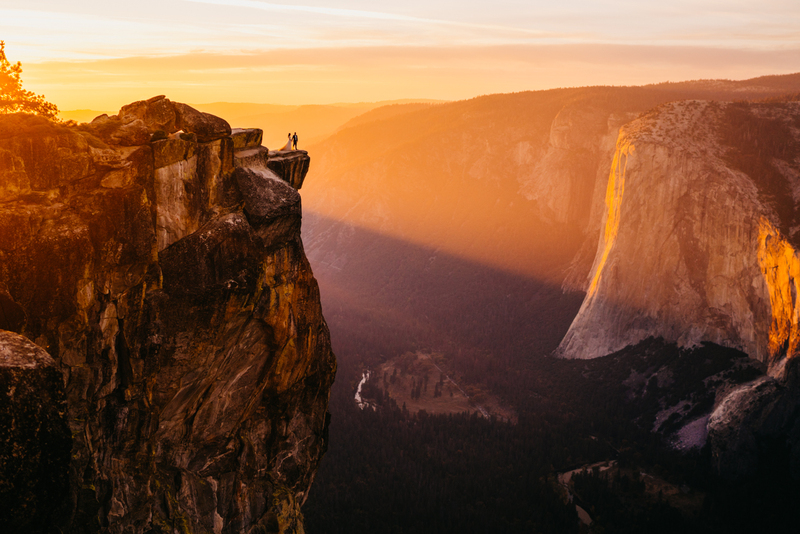 Just before sunset, we hiked out to Taft Point and I knew Daniel’s love for rock climbing meant he was gonna freak out over this place, and he sure did! He couldn’t help but climb up every rock he saw asking me, “Can I? ?” Then we shared one of the most magical sunsets any of us had ever seen. It reminded me why these intimate weddings are so special; because they’re all about what matters to you. Their wedding day was simple and slow, just surrounded by beautiful nature and the ones they love most. And it was perfect. Thanks so much for your kind words, Sharon! So happy they meant something special to you! Amazing location and photography, the cliffside photos are my absolute favorite. Great work! !